If you've followed this blog for awhile, you might be aware of our effort to build a Science Community Center on our campus, paid for by a bond measure passed by the voters in our local community a few years ago. 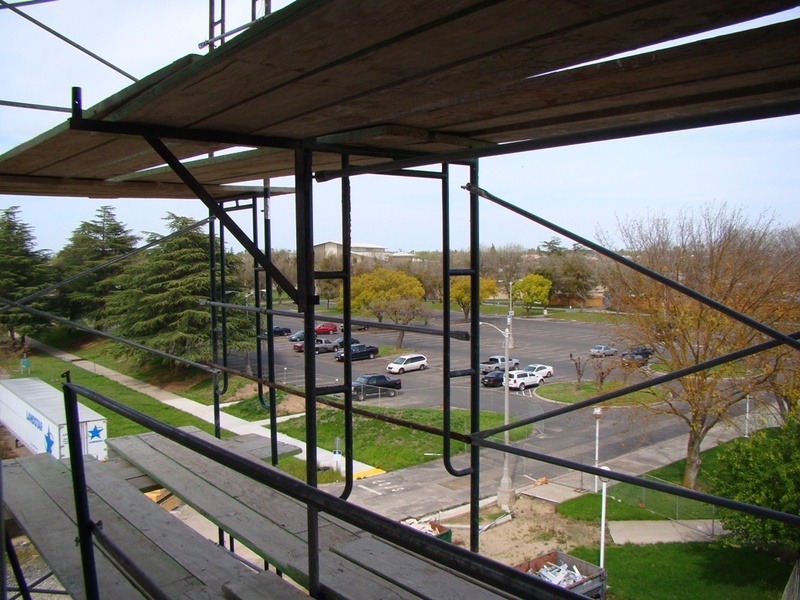 The bond passed just prior to the Great Recession, and in the disastrous years that followed, the construction projects on our campus provided some of the few construction jobs in our region. 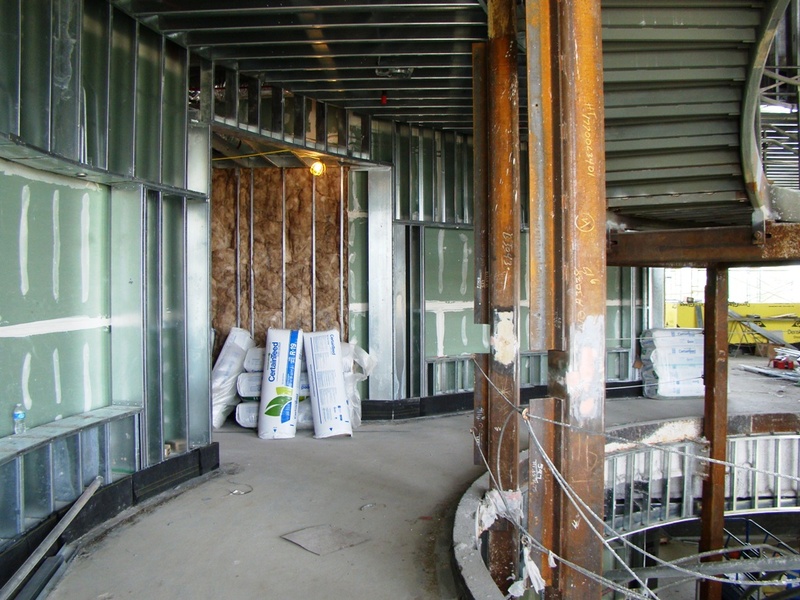 Still, campus politics threatened to fritter away the vision we had for a building that would house the physical and biological science laboratories as well as a planetarium, an observatory, and a museum. It would be a true science center, a place where the community could learn about the region's paleontology, biology, geology, and anthropology, along with astronomy, physics, and chemistry. I had trouble imagining that it could ever come to pass. Not anymore! 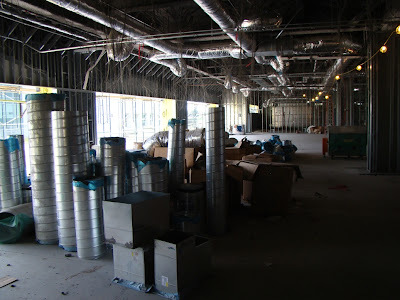 We took a tour of the facility for the first time today, which is about 7 months from completion. It was exciting to see a dream falling into place (maybe "falling" isn't the best word, but you know what I mean). 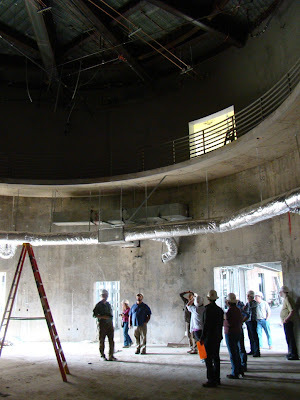 Above, we are looking at the dome of the planetarium. Below, we are looking at the main display room for the new museum. Our current facility is the Great Valley Museum, and it is staffed by talented people, and has a great program of community outreach in the form of traveling teachers, but the facility itself is hardly "great". It is in an 80 year old former house. This is a quantum leap! We will have a facility to be proud of, one that is capable of educating thousands of students every year, something that simply is not possible today. Outside on one side of the building will be a seating area that will include the names of the most important scientists in history embedded in the concrete (I think I picked James Hutton, Alfred Wegener, and John Wesley Powell for geology). 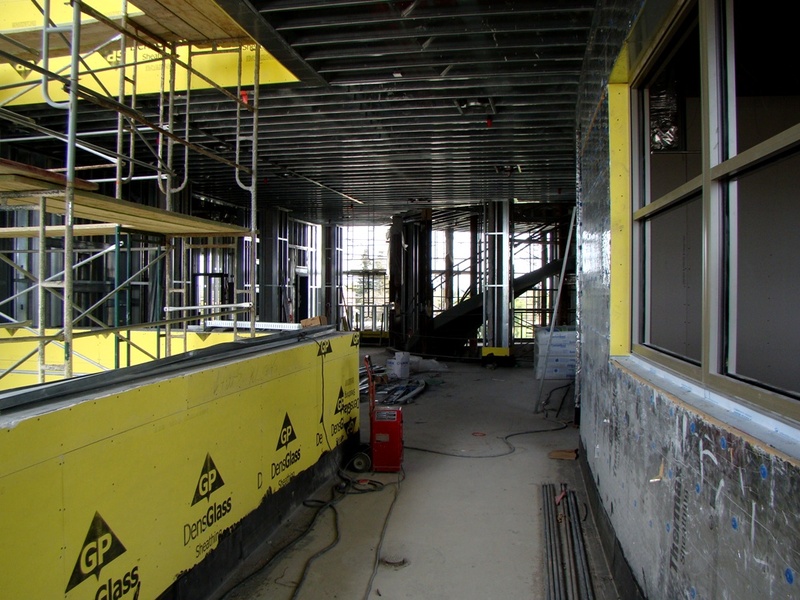 The other side of the building will have a natural outdoor laboratory with native vegetation, a pond, and a small artificial creek. 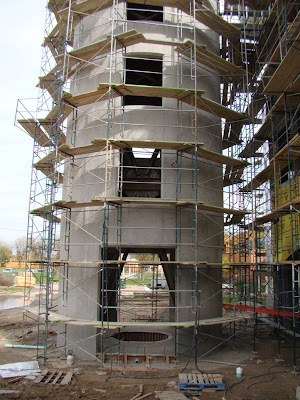 The observatory tower is four stories high, and is structurally separate from the rest of the building to keep vibrations to a minimum. 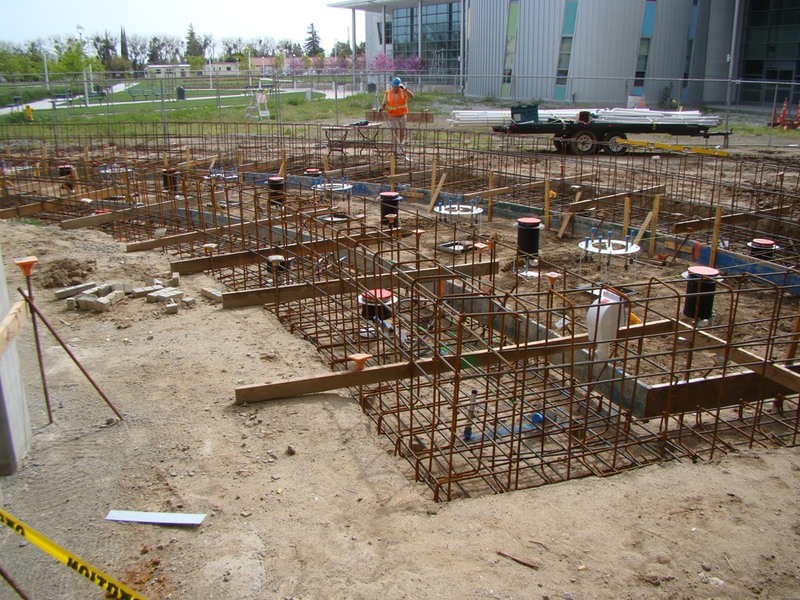 There will be a Foucault Pendulum at the base of the structure. There will also be a storage area on the roof for a dozen or more telescopes that will be used for community stargazing events. Of course, I wanted to see what would happen in the geology area. We are to be located on the third floor. 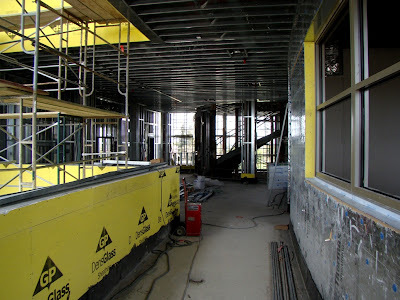 There will be an open air atrium at the top of the stairs that will ultimately have a mosasaur skeleton hanging from the ceiling. 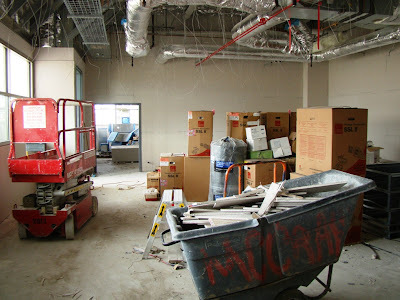 The beautiful room in the picture below will be the geology lab. It's already as messy as the lab I have now! The lab prep area was a surprise. I didn't know it would have windows. I am already thinking of displays to put there. A seismograph monitor is a definite possibility. The stairway for the building will be a work of art. It is a circular stairway, and the center of the structure will be a model of the DNA double helix running from the first floor to the third. As students and visitors come up to the third floor landing, they will be confronted by the mosasaur, and then a series of glass cases containing minerals and other geology-themed displays. 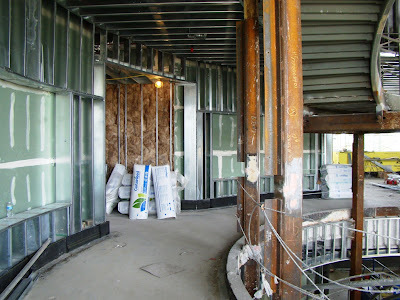 As we roamed the outside halls of the third floor, I realized a wonderful benefit of our location. We will have unobstructed views of our valley in all directions! One of the problems that I encounter is our students rarely have a sense of the valley that they live in. 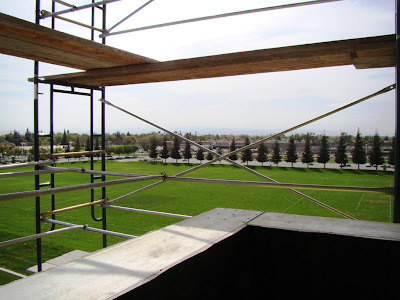 They think of it as a big flat place, but from the third floor (or from the roof on astronomy nights), they will be able to see the Sierra Nevada to the northeast, and the Coast Ranges off to the southwest. Our instructional program can now truly include a "sense of place", just by having our students walk around the hallways of the third floor. Perception is a funny thing. Our preconceived biases exert a powerful influence on our interpretation of our observations. We understand what we know, and we can't really conceive of that which we don't know. Maybe Donald Rumsfeld was onto something when he famously said "There are known knowns. These are things we know that we know. There are known unknowns. That is to say, there are things that we know we don't know. But there are also unknown unknowns. There are things we don't know we don't know." Maybe he was expressing a deep philosophical truth. Or maybe he was a prevaricating politician. But there is a truth revealed here that applies to science, and geology in particular. We are very good at not finding what we are not looking for. Charles Walcott, a respected paleontologist, discovered the incredible Burgess Shale fossil assemblage in 1909. Although he collected tens of thousands of specimens of exquisitely preserved creatures from the Cambrian period, he didn't completely realize their full potential as a window into the evolution of the earliest complex life forms. He tended to shoehorn odd specimens into known phyla and classes without exploring the possibility that these animals could be entirely different organisms from phyla that are long extinct. Often scientists will see something new, and despite their insight, they don't fully follow through. Alfred Wegener was a geological visionary who collected extensive evidence that the continents of the world had once been collected together in a huge supercontinent that he called "Urkontinent" (German word meaning "origin of the continents"). 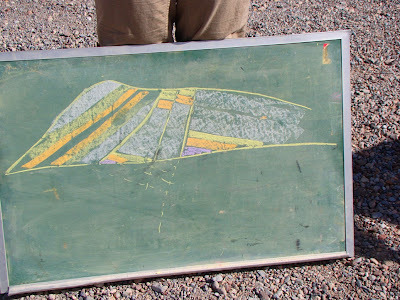 The story is told in all geology classes about how his ideas were not at first accepted by the geological community (there were some good reasons for the geologists to be skeptical, and but other objections were rather unfair). What strikes me is a rarely noted factoid: he thought of Pangea (Urkontinent) as the starting point, that continents began as a single landmass. I may be wrong about this (and I am open to correction), but he seems to never have realized that Pangea may have been constructed from the collision of earlier continents. Yet he used mountain ranges that seem to cross from one continent to another (such as the Appalachian Mountains in the U.S. and similar mountains in Scotland and Scandinavia) as his evidence for the existence of Pangea. Mountains like these were the suture zones where older continental fragments collided and melded together. There may have been as many as four "urkontinents" in the last two billion years! Would a fuller understanding of these earlier landmasses changed Wegener's approach to dealing with his hypothesis? It's impossible to say. He died in 1930 at the age of only 50. 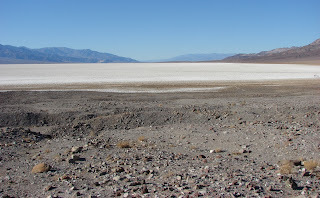 Which brings us to Death Valley and our recent trip. 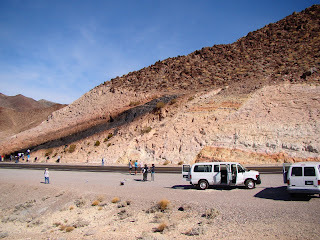 Our "strangers in a strange land" had just learned at an earlier stop that there are four kinds of faults: normal, reverse, right lateral and left lateral. 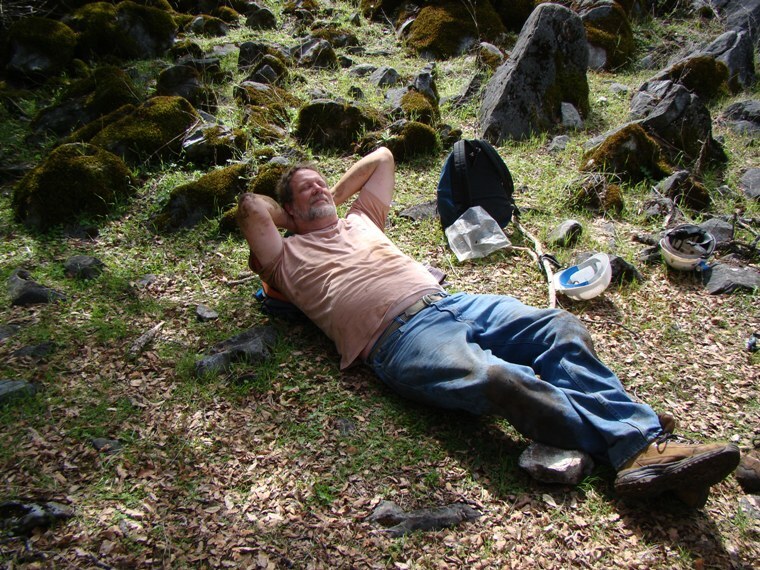 Low angle reverse faults, thrusts, are well-known from pioneering studies in the Alps and Appalachian Mountains. 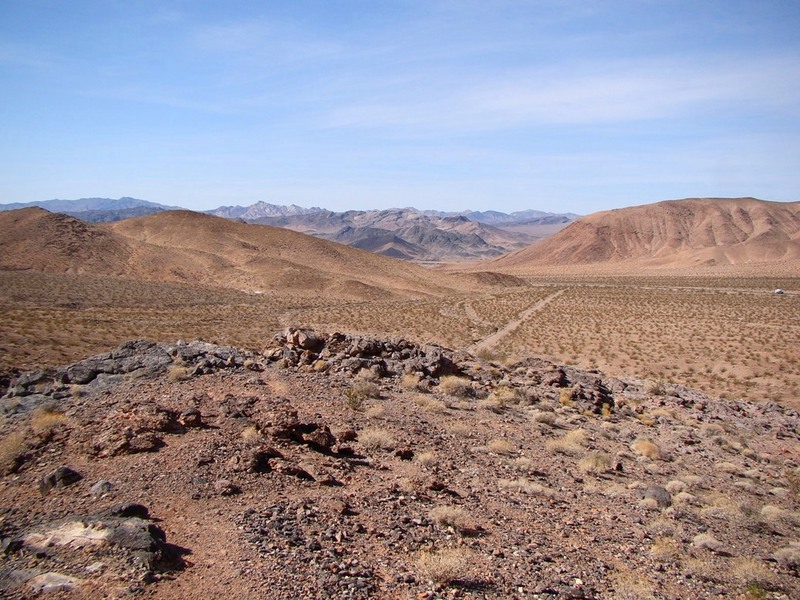 This was pretty much the status of fault classification in the 1940s when the first pioneering studies were being done in the Death Valley region. 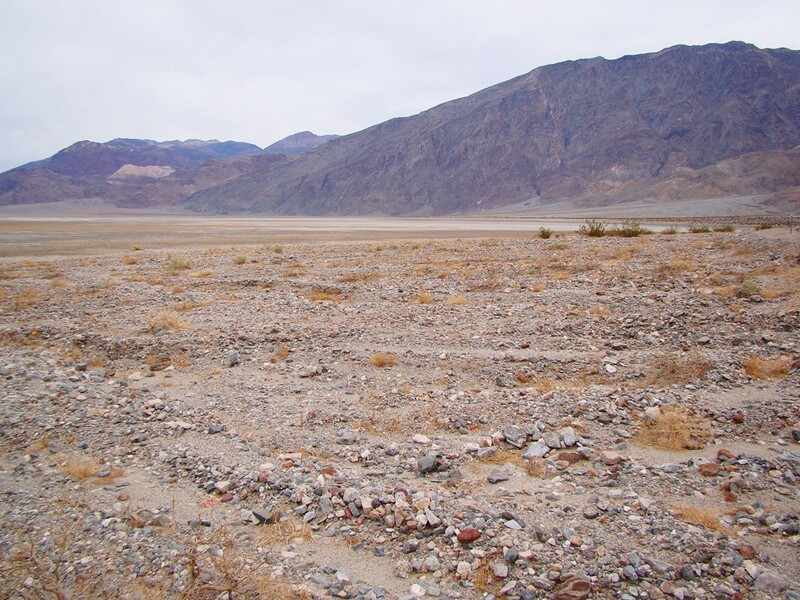 Levi Noble was one of the first geologists to map the geology in Death Valley, and the project was daunting. He was up to the task, and his maps have stood the test of time. But some of his interpretations were colored by his expectation of finding the kinds of faults he had seen before. He knew that low angle faults were thrusts, because no one had seen anything different. 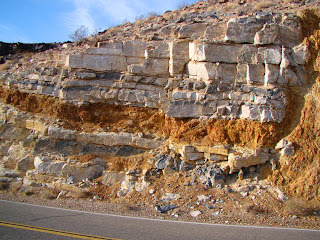 And thrusts are caused by compression, which generally causes older rock to be pushed up and over younger rocks. 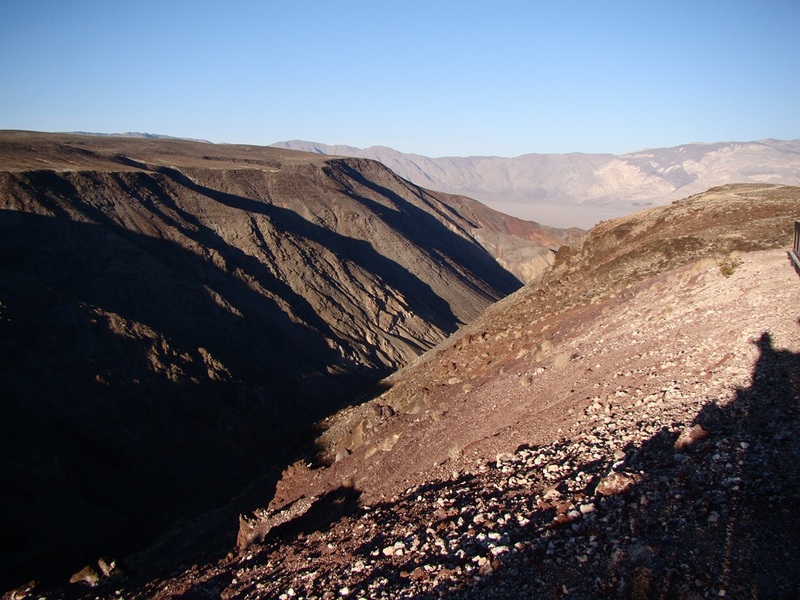 Noble found plenty of thrust faults exposed in the mountains around Death Valley. When he mapped in the Black Mountains on the east side of the valley, he found some real oddities. In some places, faults seemed to be everywhere, to the extent that the crust simply seemed to be chopped up into small bits that were only a few hundred feet across. Layers that were hundreds of feet thick elsewhere where only a few tens of feet in these outcrops, including the roadcut in the picture above, which has been called Exclamation Rock or Exclamation Point. Noble called these unique sequences, somewhat logically, chaos. 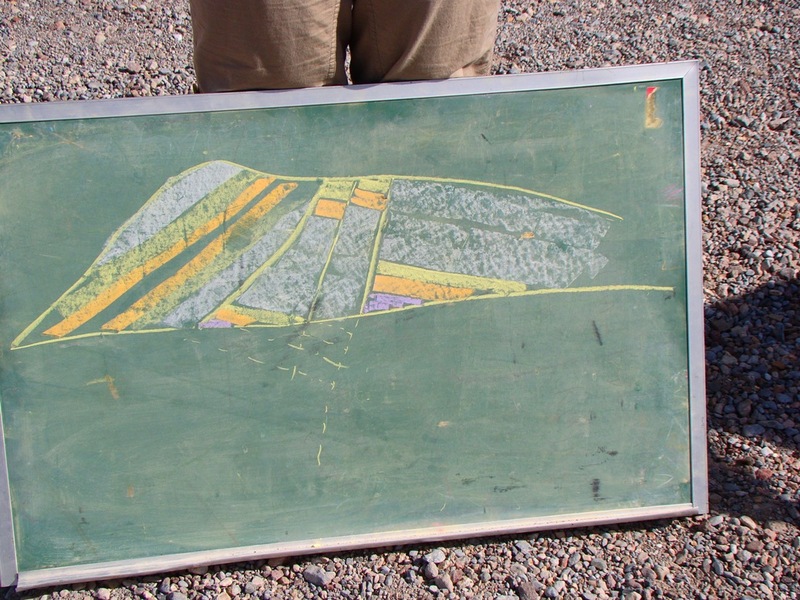 And underneath the chaos he mapped a low angle fault. It probably looked much like the fault seen in the picture at the top of this post. 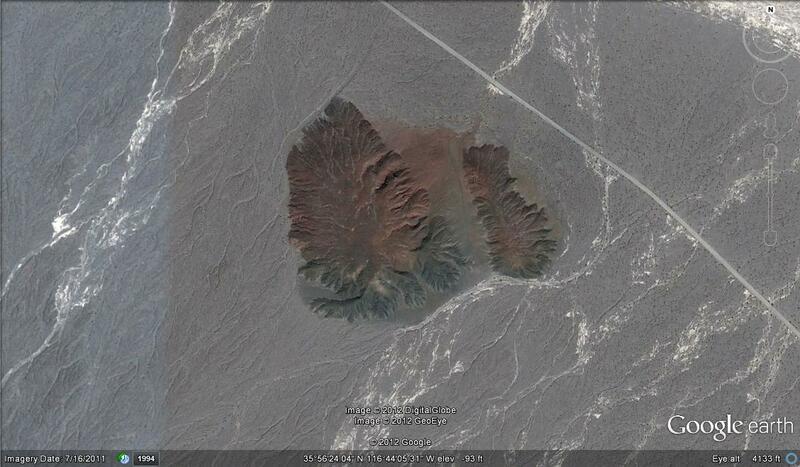 He called it, quite reasonably the Amargosa Thrust. But there was something odd about it. 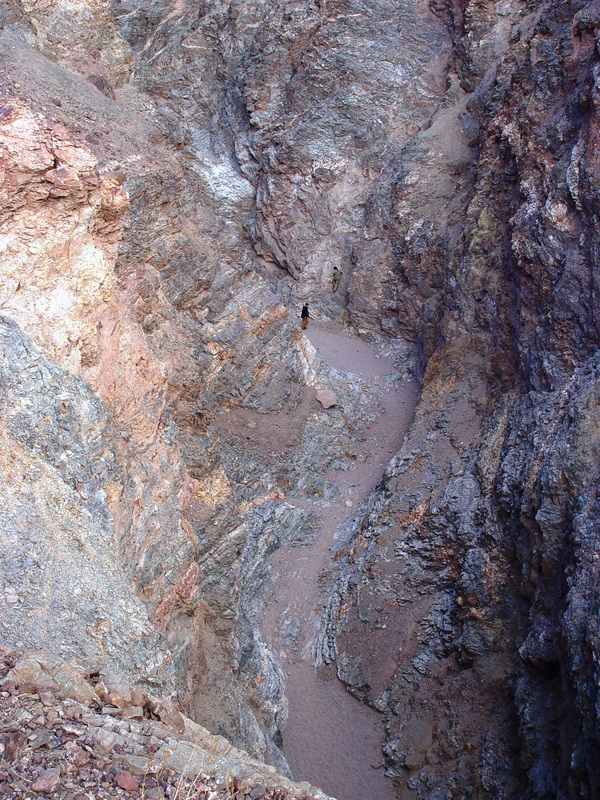 The person in the picture above is walking in a canyon that has been carved through one of the low angle faults like the one mapped by Noble. 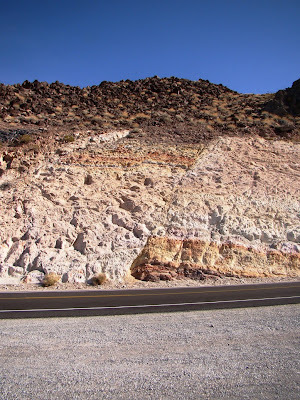 Above the fault plane is a sequence of Neogene volcanic rocks (a few million years old). The rocks in the gorge are Proterozoic gneiss and schist...more than a billion years old. Thanks to Charles Carrigan at Earth-like Planet for pointing out this opinion piece in the Washington Post. As he makes very clear, the argument that professors "don't work hard enough" is hardly fair. Professors most certainly don't get paid "executive"-level salaries. And summer "vacations"? Most colleges run summer sessions. If we don't work a summer class, then we are laid off for a few months. It is not time we get paid for. That's also a time when academic research (which is part of the expectation for most university professors) gets done, especially in geology. As I commented on Carrigan's blog, I think that arguments like this (saying that professors don't spend enough time "teaching") need to be reversed backwards onto the journalists or columnists who write this kind of material, and the private sector executives who supposedly work so hard for their money. Media talking heads only spend 5% of their time actually speaking on television? Why do they get paid the big bucks for so little work? Journalists only spend 30% of their time actually writing articles? Ridiculous waste. PR execs only spend 20% of their time making presentations to clients? Why do they get paid so much? A stockbroker spends only 30% of his time on the phone with clients? Why are they being paid so well? In all of these professions, a large percentage of the time on the job involves research and preparation. Attacking professors for not spending enough time in the classroom shows a misunderstanding of what they are expected to do. Public universities don't operate on a business plan that places profit motive over the good of the community. I suspect this is the problem with the philosophy of the columnist, who works in a privately held investment group. Research taking place in private industry is primarily driven by profit motive, and "pure" scientific research without commercial goals is generally discouraged. We as a society need a cadre of academics who do research for no reason other than to increase knowledge and broaden our scientific horizons. This is one reason why the mission of our universities is a mixture of teaching and academic research. Professors aren't paid at a level equal to their private industry peers, but those who have worked a decade or more to earn a Masters or PhD have earned the right to be paid at professional levels when they are doing the work expected of them...all of it, the classroom time, the grading, the preparation time, attending committee meetings, meeting with community members, and research (along with the onerous task of writing grant proposals). And my colleagues who work in the trenches of K-12 education need to be paid more. Think about it: these are the people in our society tasked with training future generations of our society. There are things more important than short-term business profits. I enjoy my work, but I like to think that I am doing something good for the community too. I am saddened by attacks like this on my profession. 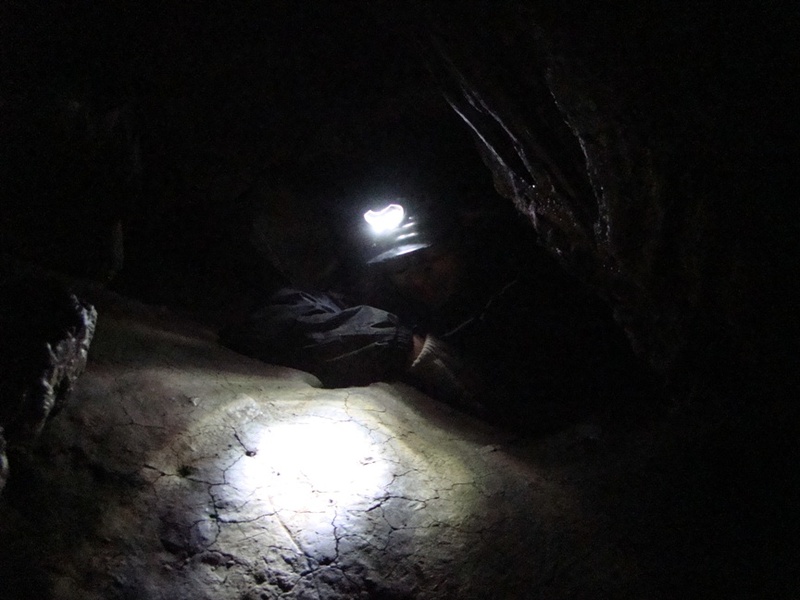 I spent the day in the Sierra Nevada foothills checking out a couple of wild caves with a few students. 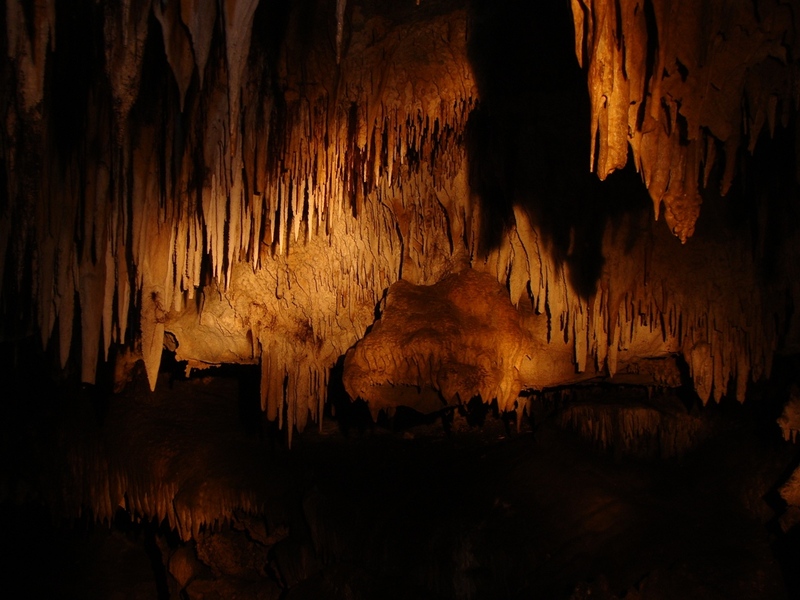 The Sierra is justly famous for spectacular alpine scenery; the underground scenery is a tad less well-known. 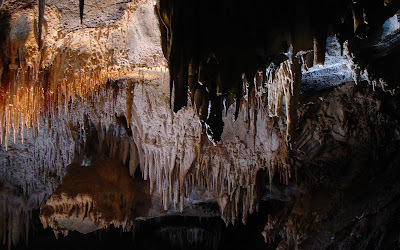 Just the same, the region has some spectacular caves, including a half dozen that are open for commercial tourism. Others are hidden away in the brushy hillsides and are a great deal harder to reach and explore, and that is the way it should be. Wild caves are a precious resource, and are easily damaged. The damage is permanent. Accessible caves have been completely stripped of their speleothems (cave decorations like stalactites and stalagmites) and filled with garbage and graffiti. I was in the inner sanctum of a particularly beautiful cavern, and thankfully many of the stalactites remained unbroken. 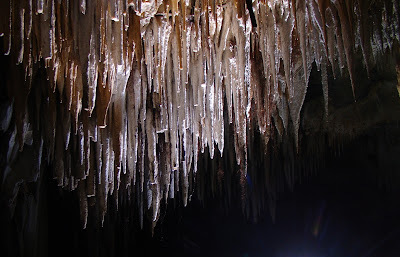 I've been in this cave several times, so instead of exploring the far corners, I sat and tried different approaches to capturing images of the thickest accumulation of stalactites near the entrance. It's a tricky process, especially for a novice like myself. Flash pictures don't cut it because there are few shadows to provide depth. I caught three images I was happy with by opening the shutter for 20 seconds and having my fellow explorers move their light sources over the target speleothems. The exploring of wild caves is not for everyone. You have to get used to crawling through tight spaces, and getting covered in mud. It can be exhausting work. 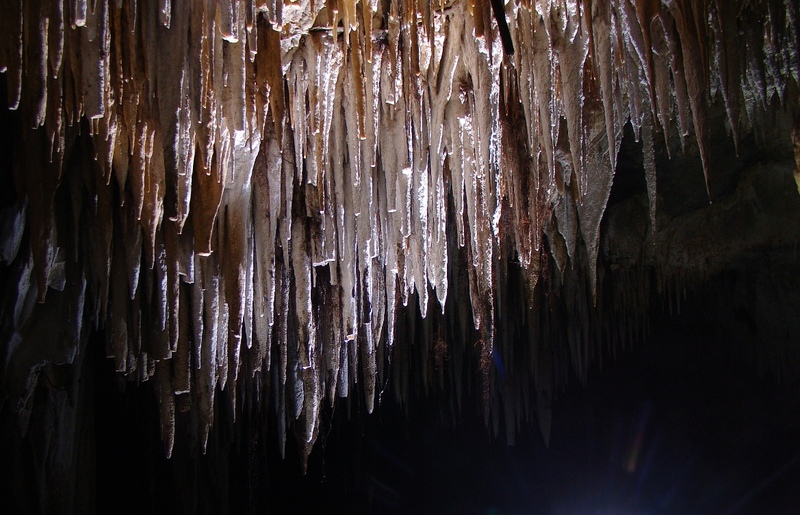 Caves can be unsafe, with unstable rocks, steep dropoffs and bad air. Hurt yourself in a cave and it is difficult to get you to medical help. 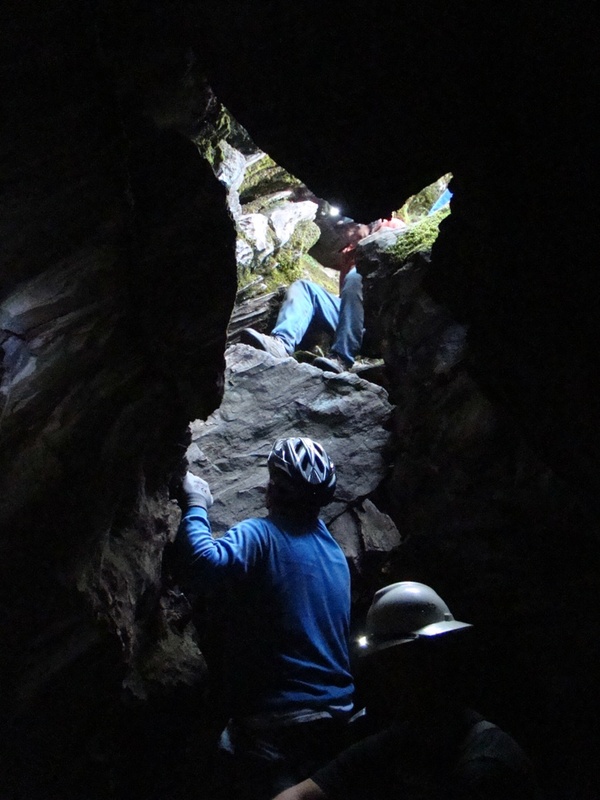 Go in without sufficient light sources, a knowledgeable guide, and improper equipment, and you could end up lost in the dark. 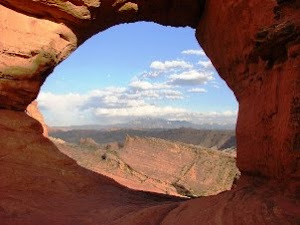 Caves do not generally offer landmarks for finding your way out. Our cave today required squeezing upwards through narrow opening with a projecting rock that meant one had to push up and turn sideways at the same time. Yeah, Geotripper was tired afterwards...then there was the mile long hike up the mountain to the vehicles. It was a good day. As can be seen in the diagram above, there are four basic faults type, normal (caused by extensional force), reverse (compressional forces), and strike-slip (the fault above is a left-lateral strike-slip; the blocks would move the opposite direction if they were along a right lateral fault). 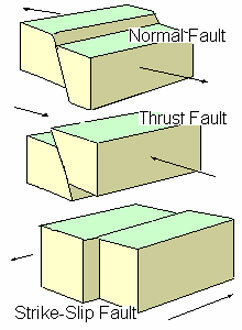 Strike slip faults are caused by shearing motion. 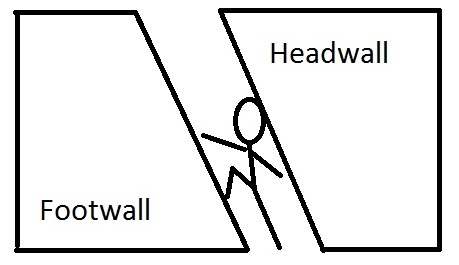 Normal and reverse faults can be distinguished by observing the relative motion of the headwall and footwall (as shown above). 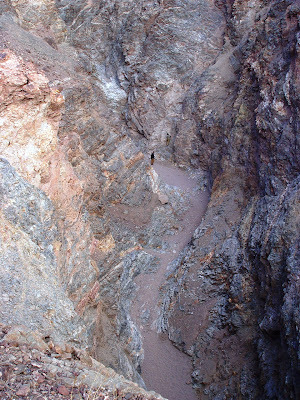 Extension causes the headwall move down relative to the footwall, making a normal fault. 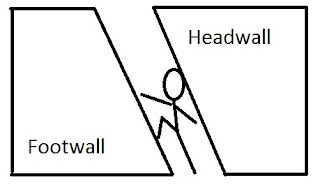 Compression forces the headwall upward relative to the footwall, forming a reverse fault. Our students had just learned about these four basic fault types at the Charlie Brown outcrop, but they were looking at fault planes in a roadcut. 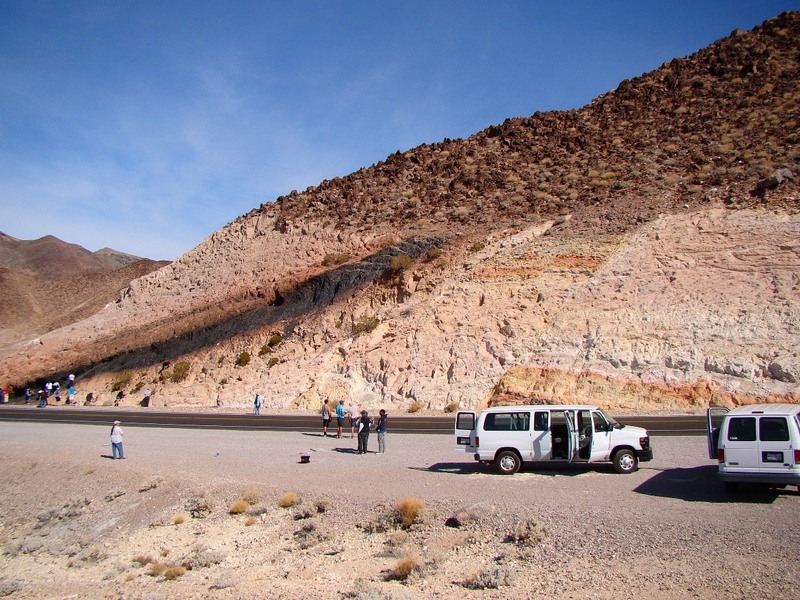 As we entered Death Valley, we started seeing the effects of recently active faults on the landscape. We stopped along the road near a couple of odd features that don't really make sense on a valley floor where deposition should be the dominant process. It was a particularly instructive spot, as we could see evidence of movement along two kinds of faults from one viewpoint. First is the terrace at the top of the post (also seen in the Google Earth image above). 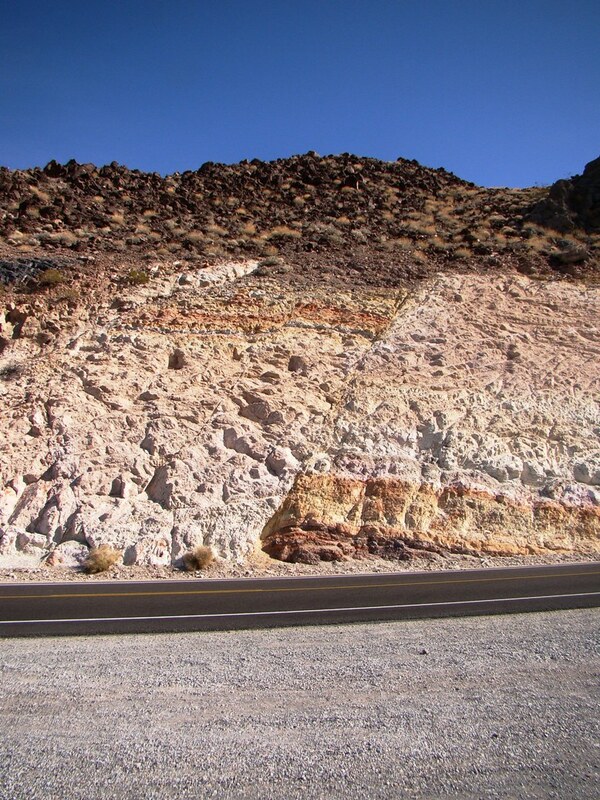 The gravelly sediments in the photo are from an alluvial fan along the base of the Black Mountains. The surface was once a smooth gentle slope, but fault motions lifted the rocks into the terrace, forming a fault scarp. The black rock is intriguing...it is basalt, which apparently rose through the crust along the weakened rock in the fault zone. 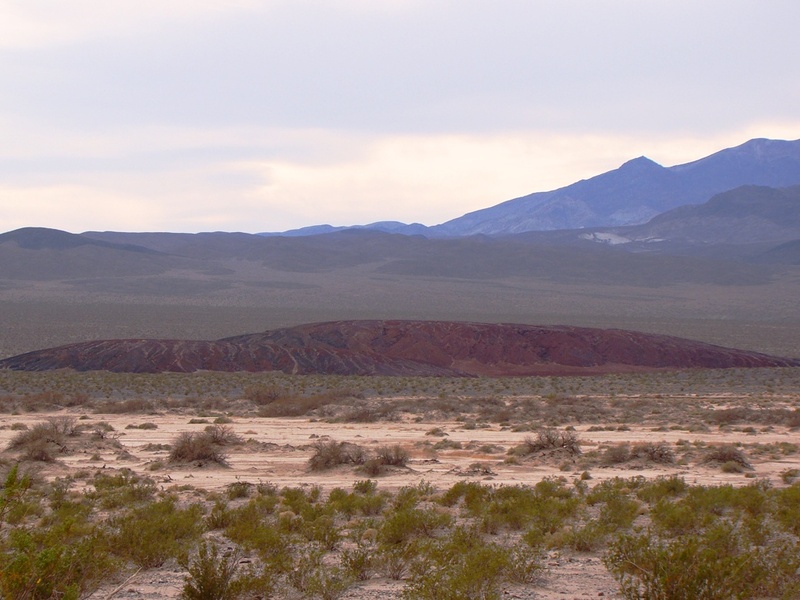 The second fault is less obvious from the valley floor where we were standing, but if you look carefully you can see that the eroded cinder cone has been split in two, and the portion of the cone on the far side of the fault has moved to the observer's right. 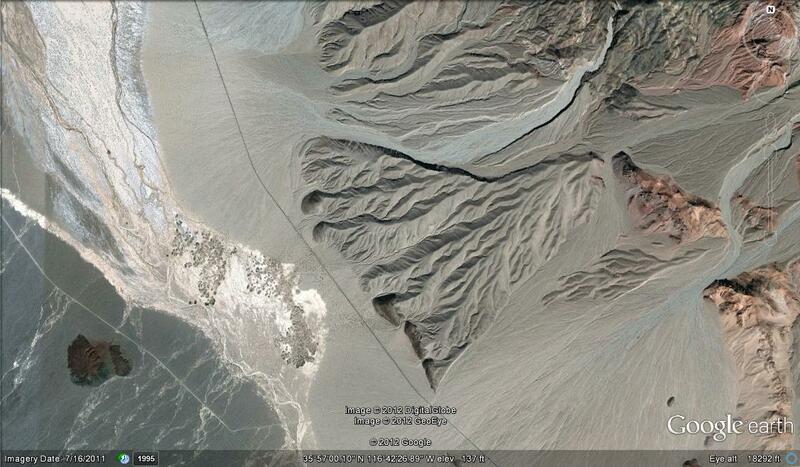 It is a right lateral strike-slip fault crossing the valley floor. The offset is clearer when seen from above, as in the Google Earth image below. This juxtaposition of two kinds of faults raises questions. Two different forces are clearly at work here, shearing and extension. Are they both presently active, or has the stress regime changed in recent time from extension to shearing or vice versa? At this point we are below sea level on the floor of Death Valley, a 100+ mile-long fault trough. Mountains rise high on both sides of the valley, with a total relief of more than 11,000 feet (few places on the continent can claim such extreme elevation changes over so short a distance). Such fault valleys are termed grabens (the German word for grave or trench), while the mountains are termed horsts (German for eagle's nest or aerie). Although we could not see an example from where we were standing, the Death Valley region also has examples of reverse or thrust faults (thrusts have a fault plane angle of less than 45 degrees). They have a tendency to push older rocks over younger, as can be seen below along the Keystone Thrust west of Las Vegas. 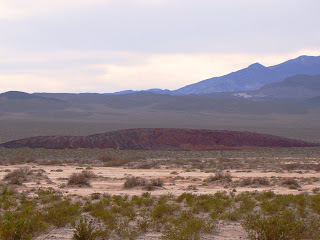 The gray layered rocks are Paleozoic limestone formations (400-500 million years old) which have been pushed over the bright yellow and orange rocks of Mesozoic sandstone formation (around 200 million years or so). 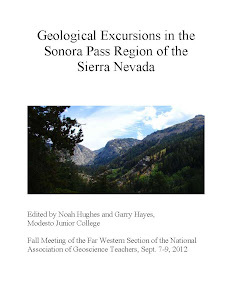 Check out Georney's on the ground visit of the Aztec Sandstone at Red Rock Canyon here. These faults are not currently active. Which of the two pictures below is more strange? Which has creatures that are more out of place? I know that my series on Strangers in a Strange Land has been about Death Valley and the Mojave National Preserve, but the title seems appropriate here as well. We were chasing a storm eastward into the Sierra Nevada foothills to see whether the flowers were making a spring appearance. There weren't too many just yet. The storms this week dropped nearly three inches of rain in our area, which may not sound like much, but it is a quarter of our yearly average, and yet it only gets us to about 60% of normal. It's been a pretty bad drought, in other words. 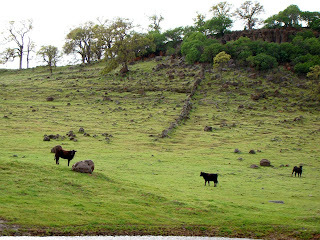 We were driving past a ranch in the foothills, and the grazing animals looked out of place. 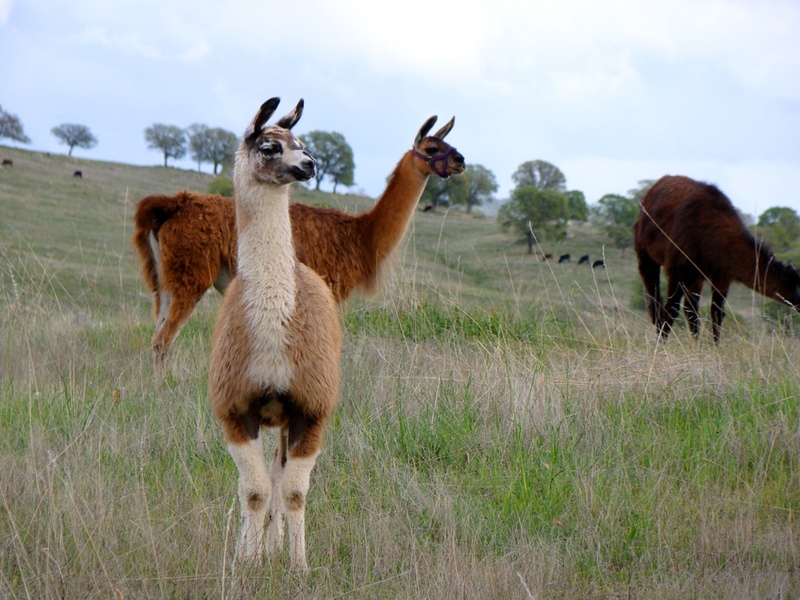 We stopped for a closer look and realized that there were llamas out in the field. Llamas! 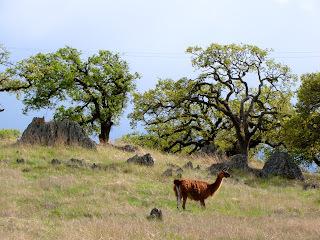 What could be a stranger sight in the grassy foothills of the Sierra Nevada? 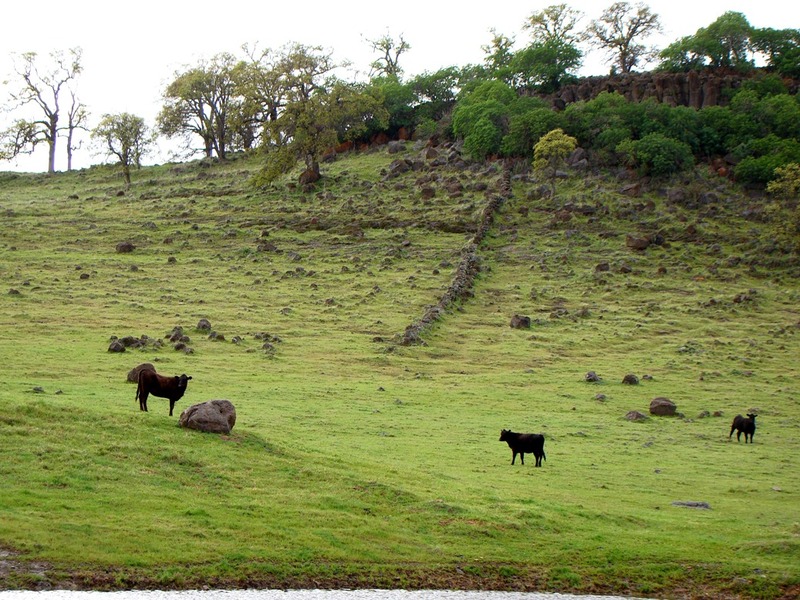 When we think of grazing animals in this region, we mainly think of cows. 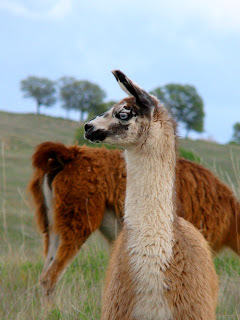 But from a geological point of view, the llamas make a great deal more sense. Why? Because they are camelids. That doesn't seem to make any more sense, since most people know that camels are only found in the Middle East and Africa. But the llamas and the camels should feel perfectly at home in California and the rest of the North American continent. Their evolutionary heritage is right here. The first camels evolved here around 45 million years ago, and dozens of species evolved in the wide grasslands across North America. Some groups moved into Asia a few million years ago over the Bering Land Strait. Two or three million years ago other groups crossed over the newly formed Isthmus of Panama when North and South America became connected. Their story parallels the evolutionary history of the horses, who also traveled both directions out of North America. They continued to thrive in North America until just 11,000 or 12,000 years ago when the camelids and the horses and a host of other large species went extinct. The reasons may be related to climate changes or to overhunting by recently arrived humans, or some other unknown agent, but they disappeared. The cows that graze our grasslands today arrived much more recently with European settlers, but they evolved in Europe and Asia. They are the true strangers in our strange land. The llamas are grazing over the graveyards of their distant ancestors. As teachers, we hope to go in the field with our students in hopes that they can related cartoons in a textbook with exposures in the real world. Then we get there, and we find together that sometimes the "field" does not readily give up secrets. There is this phenomena called "weathering" that renders rocks indistinguishable from other rocks. 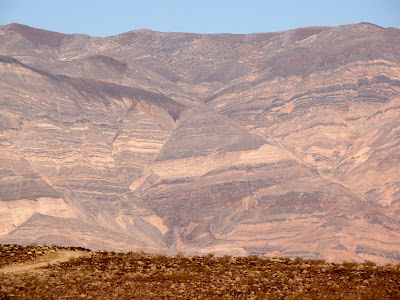 Take the above scene, from an area near Shoshone, a little village east of Death Valley National Park. If we were back east somewhere, there would be a complete covering of green organic material that biologists call trees and shrubs covering most of the rocks, rendering identification and interpretation practically impossible (and believe me, I appreciate and admire those who figured out the story of places like the Appalachians and the Canadian Shield). 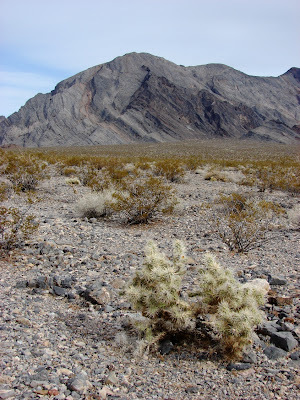 But even here, where the climate is so dry that plants can scarcely survive, the rocks are still obscured. 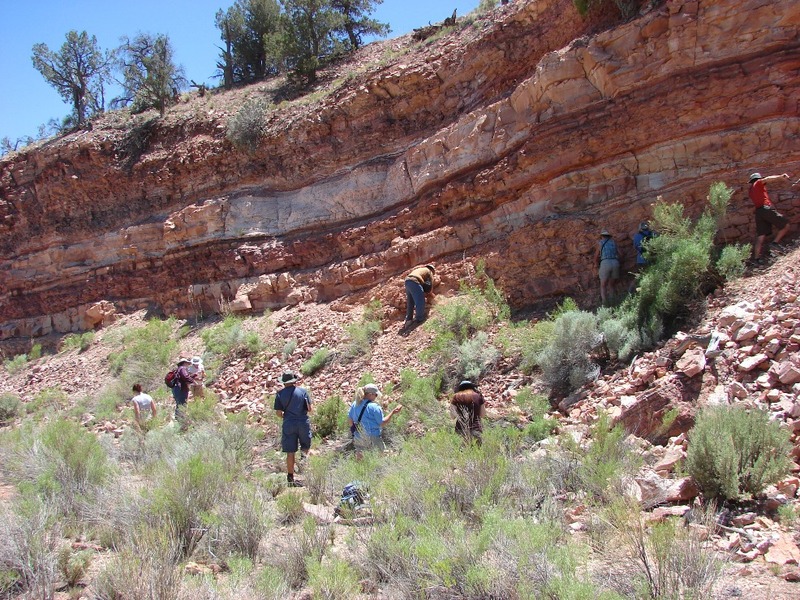 The geologists who have training in field methods can make sense of this sort of landscape, but students who are in the field for the first time can feel intimidated. 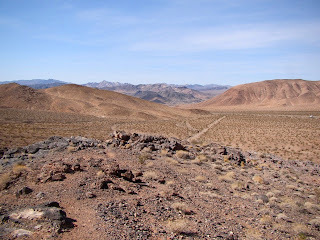 A few gray rocks in the foreground, some tan colored rocks across the small valley, and a difficult time understanding how they relate to each other. It would be a challenge. But once in a while, the department of transportation does us a real favor. They want to make their roads straighter, and when nature hasn't cooperated by eroding into straight lines, they make roadcuts for us. That's an outcrop! This is one of those sweet times when the real world looks a lot like the textbook diagrams, so the students get to do some basic interpretation of rock relationships without having to visualize obscured contact lines. 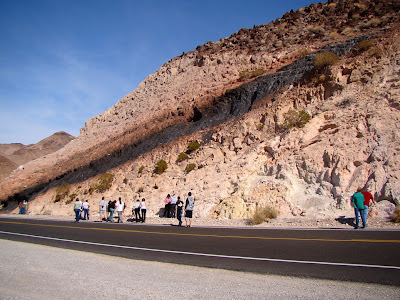 Many field trips visit this outcrop, so much so that the department of transportation has left behind a parking area across the street that is big enough to accept even buses. 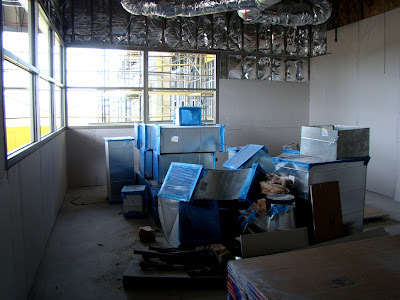 So, what would you do with your students here? Oh, and by the way, all you mineralogists out there, what do you think this nice botryoidal mineral might be? I have my strong suspicions about a relatively simple answer, but I've just assumed it for a long time. 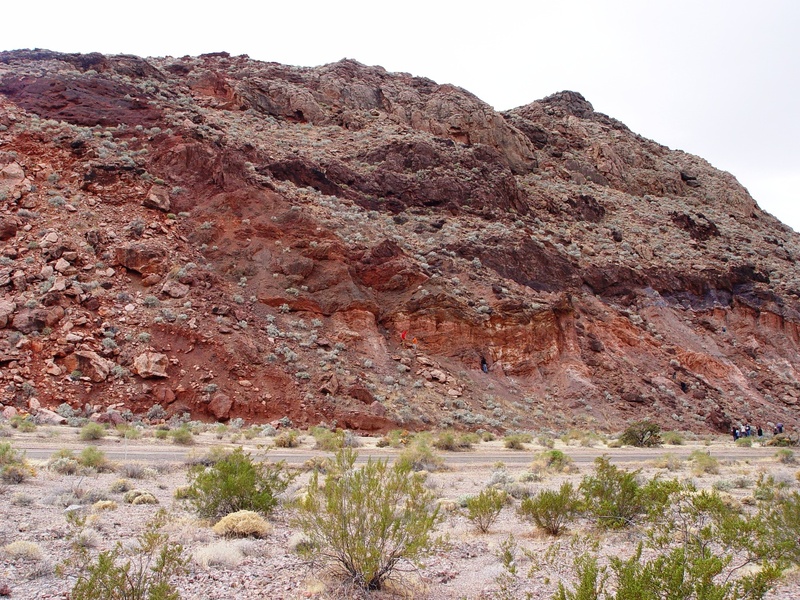 The host rock is a rhyolite tuff, and hot vapors and groundwater have probably both influenced the outcrop. The larva emerged from the egg and began drifting in the gentle current. It was a bilaterally symmetrical body that recalled a small chordate, but it wasn't. The ciliated body allowed it to swim to some extent but within a few hours it settled to the sea floor and a remarkable change occurred. It began to develop an odd five-fold symmetry. That placed the organism in the lineage of the phylum echinodermata. Over time the organism developed a stalk with a root-like holdfast, and a flower-like "head" on top. As much as it looked like a plant, it was indeed an animal. The "flower" was a food collecting organ with feather-like appendages that captured small bits of food drifting by in the currents. The edible particles were transported to the mouth at the center of the "flower" and consumed. The stalk gave the organism an advantage over bottom dwelling filter feeders by extending above the other benthic species. 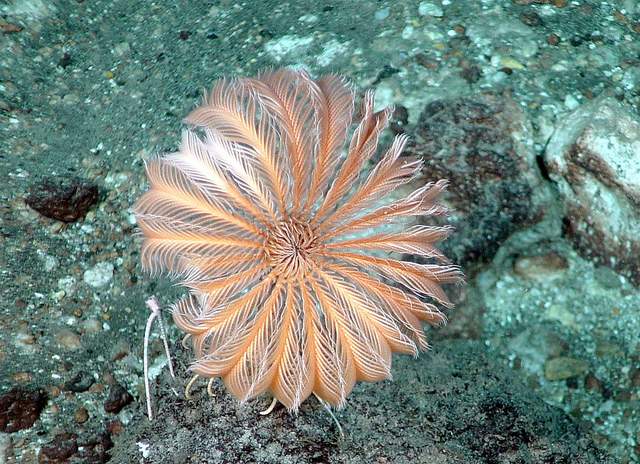 These crinoids, also known as sea lilies, were hugely successful in their time, with thousands of them anchored to some parts of the ocean floor, waving like a field of wheat at the bottom of a warm tropical sea. This particular individual lived for several years, but during a tropical storm the turbulent water broke the stalk off, and the calyx sank to the seafloor and the crinoid died. The calyx broke into numerous calcite plates, and the organism was added to the remains of thousands of crinoids that had died before. In time the bits of stalk and little platelets were buried under the constantly accumulated debris from crinoids that were born much later. 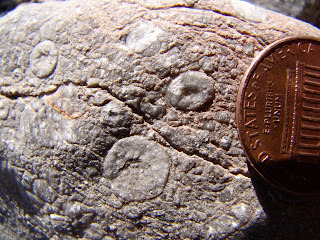 Over time the water was mostly squeezed out and the crinoid debris began to lithify, that is, it turned to solid stone. More sediment covered the limestone, providing additional pressure, and soon the remains of the small crinoid were pretty much removed from the effects of surficial processes. Then came the vast void of time. For more than 100 million years, the crinoid stalk simply existed, pretty much without change, other than a very gradual buildup of pressure as the rock was buried ever deeper under thick sequences of sand, silt and limestone. Time ebbs and flows. Sometimes things happen very quickly, but in other situations time seems endless. The crinoid lived for only a few years, but it lay buried for millions. In this kind of immortality, sentience would be a curse. Entombed in total darkness and silence for endless millennia, insanity would be a blessing. Time wore on, and the only indications of activity were the occasional earthquake and slow change of orientation and temperature. It was also getting hotter, for big things were happening above. The ocean had disappeared, and the rocks that had lain at the bottom of the sea were now pushed up into a mountain range. Out to the west, a subduction zone had developed, and the resulting compressional forces had buckled the rocks into a series of folds and thrust faults. A few tens of miles away, vast bodies of magma were intruding into the overlying rock, although the fragments of the crinoid were not directly effected by the igneous activity. They remained entombed in the darkness, and over time the mountains above were smoothed by erosion to a fairly muted landscape of low hills. More millions of years passed, but the pace of change increased. There were more earthquakes, and there was an imperceptibly slow change in the amount of pressure. One day there was a crack as the stressed rock relaxed by fracturing. And then again. And then, for the first time in millions of years, water started seeping through the small fractures. The water was not salty; it was groundwater coming from rainstorms far above. Sound became more perceptible; thunder and the shattering of stones rolling down a hill. One day, light appeared as a rock fall exposed the bit of limestone encased in what turned out to be a high cliff. A short time later, the limestone bearing the fragments of the crinoid fell out of the cliff onto the talus slope below. After the insanely slow pace of change over millions of years, events were now dazzlingly fast. 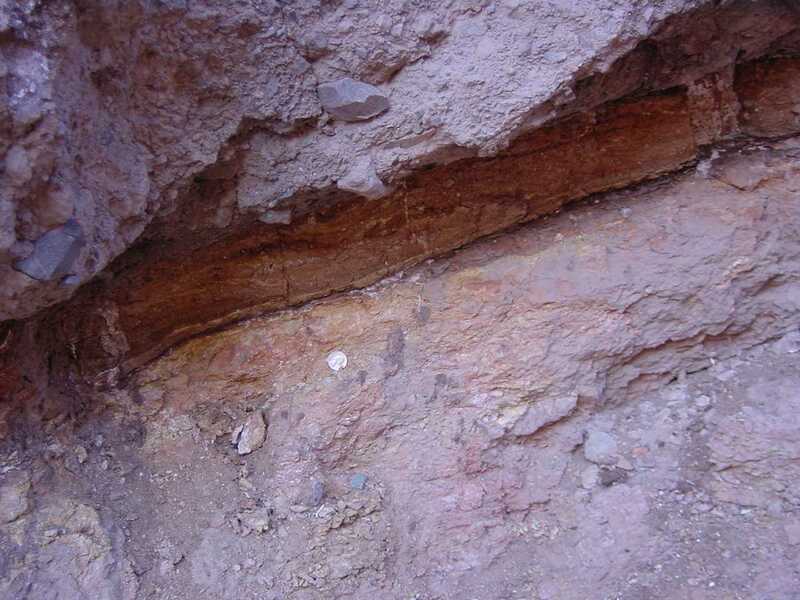 One afternoon, a particularly intense thunderstorm produced a mudflow that tore away the base of the talus slope, and the chunk of rock containing the crinoid was lifted and carried in a slurry of rock and fine-grained sediment. This one storm only carried the boulder a few hundred yards, but the next storm and the one after carried the rock for several miles out onto an alluvial fan. The rock sat, exposed to the occasional rainstorm, the endless heat of the blazing sun, and the growth of small shrubs and perennials. The surface of the rock became etched, and the structure of the original crinoid stem became obvious, enough that a semi-sentient being perceived that the one stone was different than the others nearby. He picked it up, considered the nature of the once living organism, snapped a picture, and laid the stone on the ground again. He wandered off. 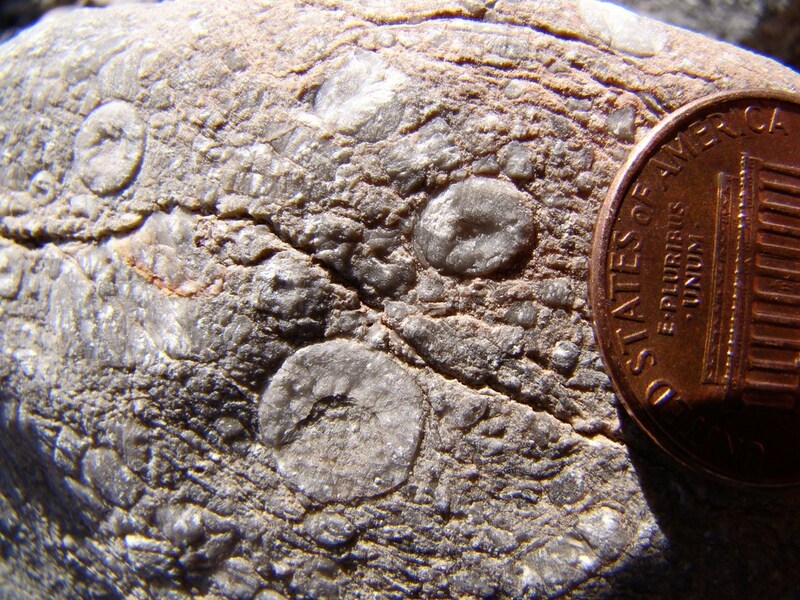 300 million years after the small crinoid lived and died, the last vestiges of its existence would soon dissolve away, and its constituent atoms would be distributed through the soil. It will soon be gone. And that is the story of the crinoid I found last month. 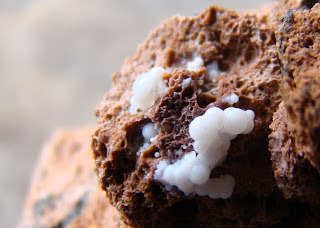 I've always thought about rocks this way, but in presenting the narrative in this style, I was no doubt influenced by The Planet in a Pebble: A Journey into Earth’s Deep History by Jan Zalasiewicz, which I reviewed a while back. 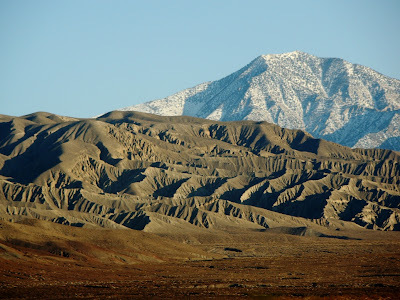 Strangers in a Strange Land is my series on the geology revealed during a series of trips to Death Valley and the Mojave National Preserve in February and March. The travelers who were the Strangers in a Strange Land had reached the end of the day, and had crossed the boundary into Death Valley National Park quite a few miles ago. 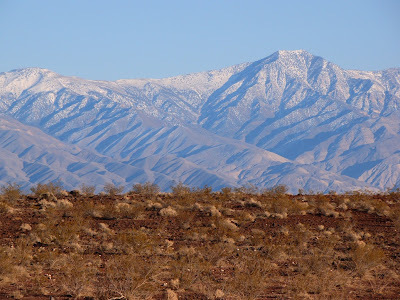 We were looking at an astounding desert valley, with high snow-capped mountains in the distance, vast fault scarps, wide desert playas, and deeply carved desert canyons. In the geologic sense, Death Valley may very well be the most diverse national park in our country. 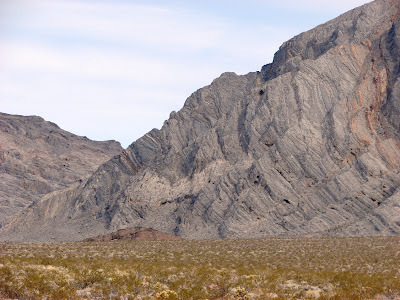 It has some very old rocks, possibly dating back as far as 2.5 billion years, and rocks that formed in just the last few hundred years (at Ubehebe Craters and on the Badwater salt flats). More extraordinary than the range of ages is the completeness of the rock record. The park has Archean and Proterozoic rocks, it has some of the thickest Cambrian rocks to be found anywhere, it has rocks from every period of the Paleozoic era, and though not as widespread, it has rocks from the Mesozoic era as well. 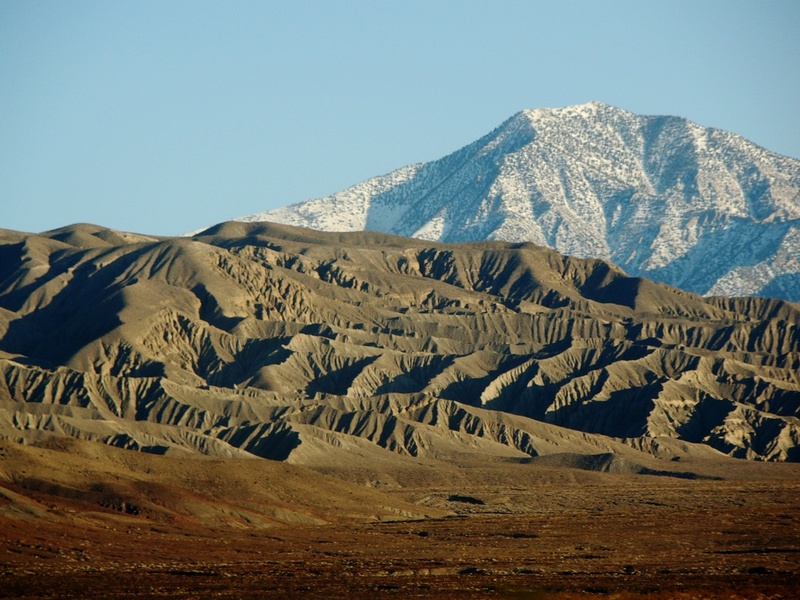 Paleogene and Neogene periods of the Cenozoic era are represented by beautiful sequences of terrestrial sediments, especially in Titus Canyon and near Furnace Creek. Just the one picture above includes Neogene basalts, Jurassic-Cretaceous granites, Paleozoic carbonate rocks, and Holocene sediments. Death Valley also packs in some big extremes. The relief of the park (the difference between the highest and lowest point) is about extreme as it gets, more than 11,000 feet. 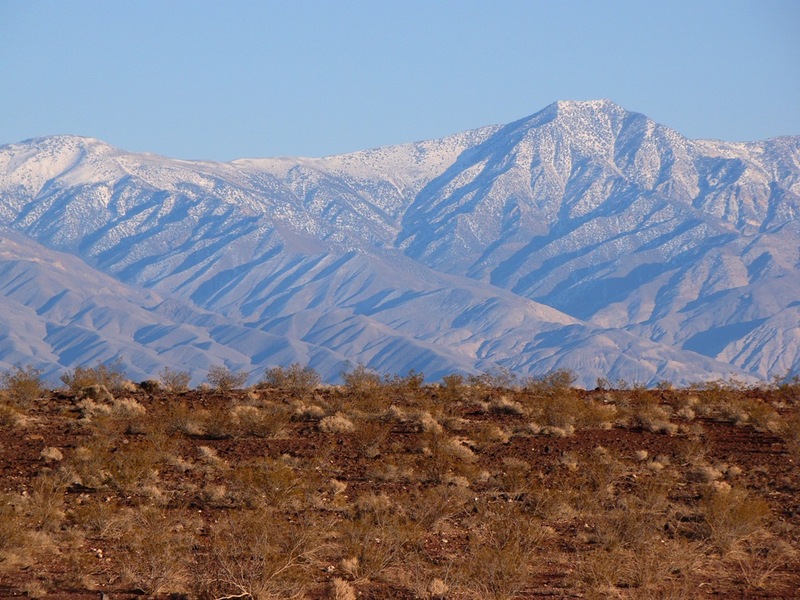 There are some seasons in the year when one can be baking in 100 degree plus heat on the valley floor, and find relief by standing in the snow on the flanks of Telescope Peak (above). 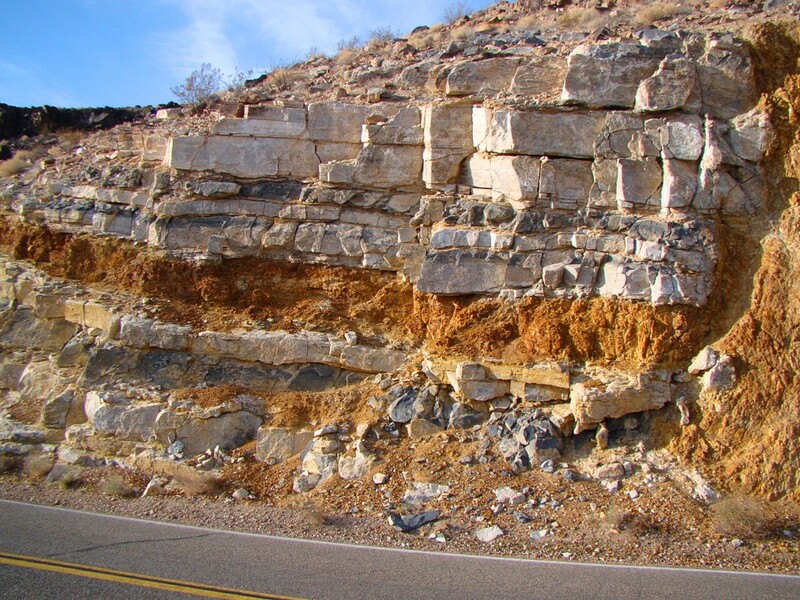 The Late Proterozoic-Paleozoic rocks, such as those seen in the Cottonwood Mountains above, have a total aggregate thickness of more than four miles! 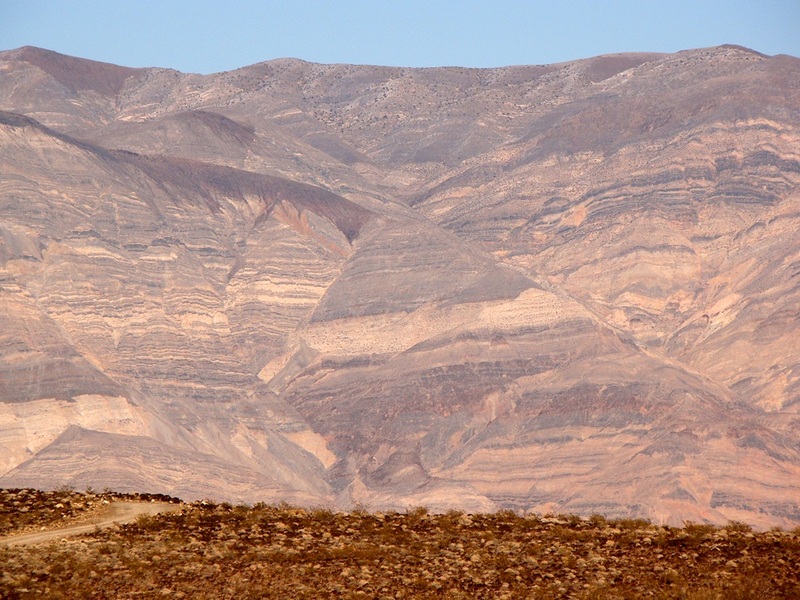 And for desert landscapes, Death Valley is unrivaled. Not the stereotypical saguaro cactus type of desert, but evidence of erosion and deposition in an extremely dry landscape. 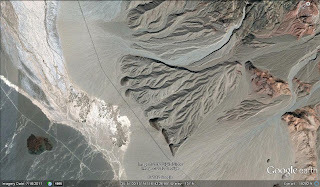 Sand dunes, alluvial fans, bajadas, playas, and pediments are well-represented. 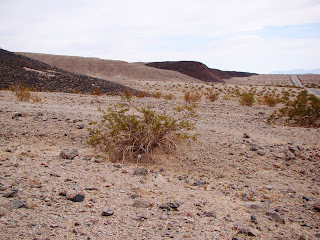 And tectonic activity: faults, folds and unconformities are found all over, starkly exposed in the vegetation-challenged landscape (that's not saying "no plants", as the park also hosts a huge number of plant species; they just don't cover everything). Did I mention that the park is big? It's really big, covering more than 3 million acres, making it the largest national park in the lower 48 states (and also Hawaii). Just how big is that? 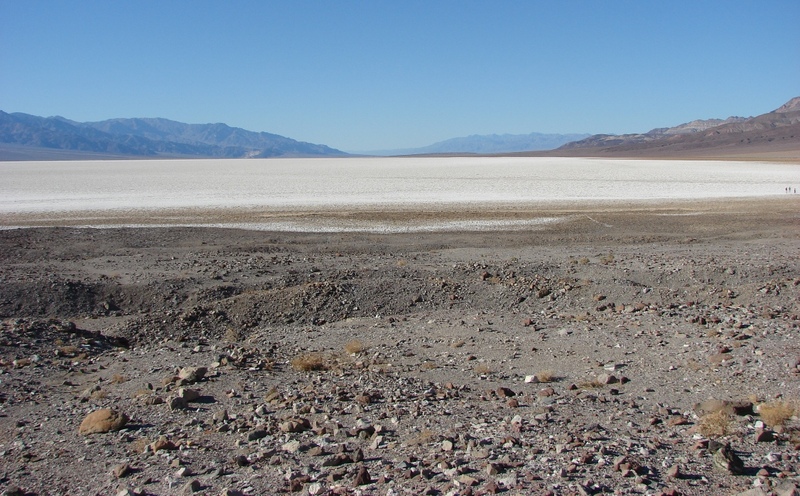 Death Valley itself is more than 100 miles long and 15-20 miles wide. 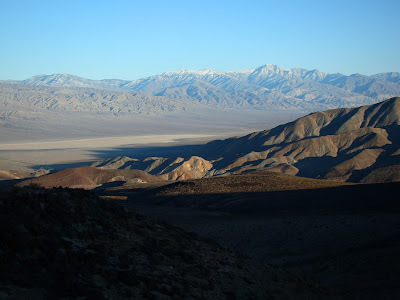 But it is just a part of Death Valley National Park. 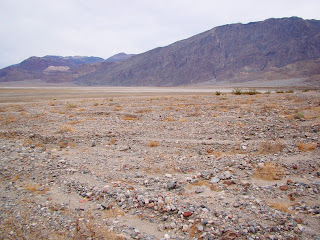 All the pictures that I took of this long impressive valley were taken in Death Valley National Park. But you haven't even seen Death Valley yet. 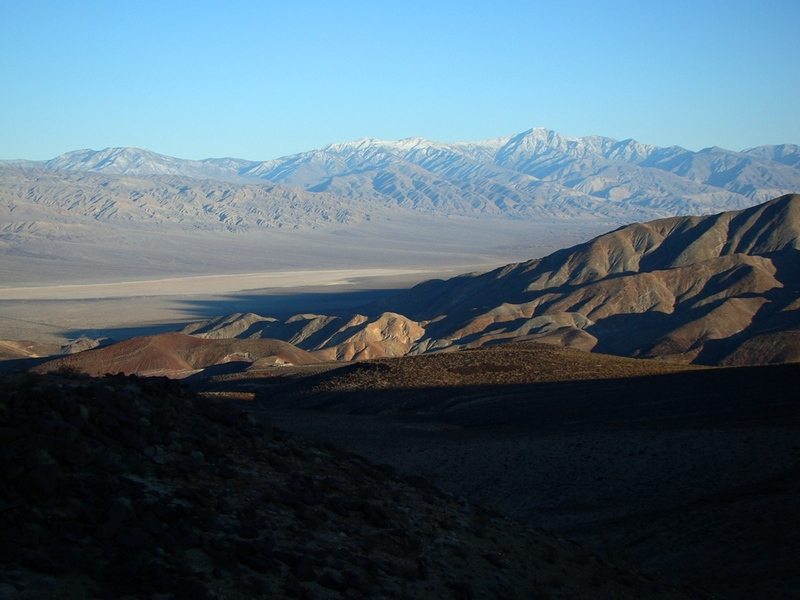 This is the Panamint Valley, a spectacular desert valley in its own right, which was added to the national park in 1994. 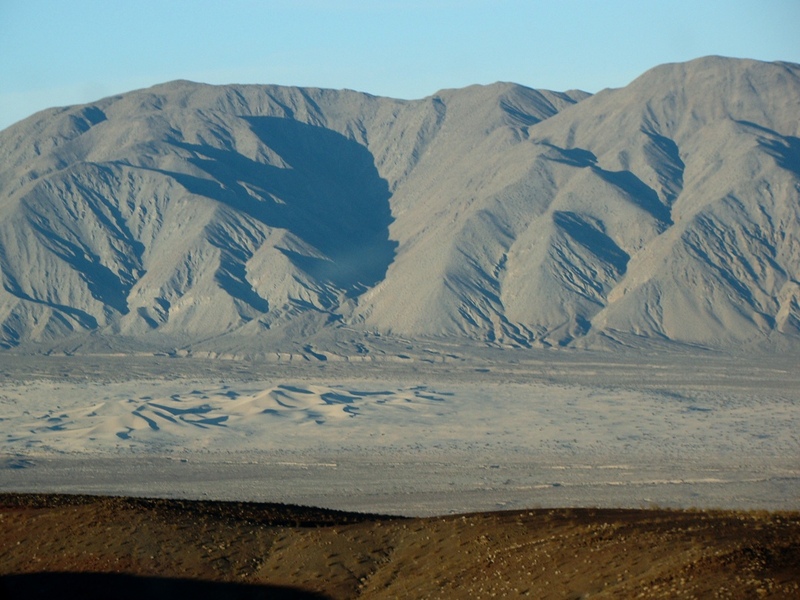 Those are the Panamint Dunes in the picture above.